In this section, candidates for office will find information and links to assist them to locate information and forms required to run for office. The Grundy County Clerk and staff cannot provide a review of nominating papers or legal opinion regarding petition papers. Candidates are encouraged to obtain legal counsel as to their qualification for office, preparation of petition papers, circulator requirements, signature requirements etc., and for any campaign or election related questions. After petition papers have been filed, pages cannot be amended or added. A receipt for filing the required Statement of Economic Interest (SEI) may be added until 5 p.m. on the last day to file. Circulation periods, filing information, appropriate forms are available on the Illinois State Board of Elections website or in the Grundy County Clerk/Election Authority’s office. In order to be a Write-In Candidate, an individual must file a notarized “Declaration of Intent to be a Write-In” form with the County Clerk at least 61 days prior to an election. However, when an objection to a candidate’s nominating papers or petitions for an office is sustained after the 61st day before the election, the candidate can file a notarized declaration to be a write-in candidate for that office with the County Clerk no later than 7 days prior to the election. 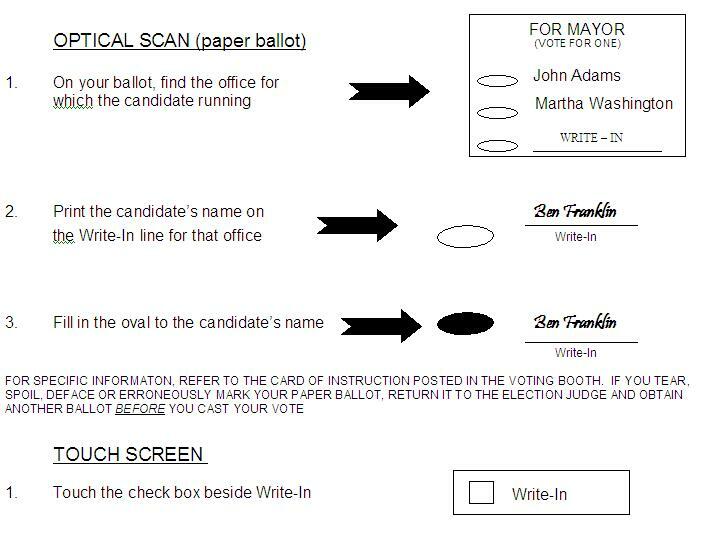 How to cast a Write-In Vote on the Optical Scan (OS) and Touch Screen (TSx) correctly so your vote will count. On Election Night, only Election Day ballots cast, Grace Period / Same Day Registration, Early Voting and Vote by Mail (ballots received through Election Day) will be tabulated for unofficial results. Write-In Candidate results will NOT be available until after the RETAB / CANVASS of Election, which is scheduled approximately 2 weeks out from Election Day.